The dark and moody song “Hangin’ On to That Man” has music written by Russian-born composer Josef Myerow, who later as Joe Myrow would compose the popular “You Make Me Feel So Young” (1946). “Hangin’ On to That Man” is recognizably a torch song, insofar as it involves a woman describing how she keeps loving a man in spite of all the misery that he causes her. The song is thus very much in the mold of Mistinguett’s “Mon homme” or its anglophone version “My Man” (made popular by Fanny Brice in the 1921 Ziegfeld Follies). It is not clear to me if anyone other than Elsie Carlisle ever recorded “Hangin’ On to That Man”; Ethel Waters is mentioned on the sheet music, but I have no evidence that she ever committed the song to shellac (she probably performed it on stage). It is therefore interesting that Elsie recorded the song not once but three times. She made the first two recordings with Spike Hughes and His Dance Orchestra, and we are fortunate enough to have Spike Hughes’s own account of the genesis of his sessions with Elsie. In the days when I had had colourful visions of making a fortune writing blues and low-down songs, I had a great ambition to write a song that Elsie Carlisle would sing, perhaps even sing on the radio and record. I don’t think, as a matter of truth, that I had ever heard her sing in those days, but her face made a pretty picture on a song of which I was very fond around 1929, and I thought she would probably sing my masterpieces better than another other native singer. When she first started recording for Decca a contingent from the band used to accompany her, and I found that my dream-singer, whose picture I had liked so much in 1929, sang every bit as well as I had imagined. But I had no songs, no blue masterpieces to offer her. Obviously, she must appear in one of my records, for she was good company. After sessions she would entertain at a neighbouring public-house with unlimited Lancashire stories, which endeared her particularly to young William Walton, whose local the “Six Bells” was, and who, like Elsie, also came from Oldham. The session that Hughes describes seems like a poorly remembered version of the June 18, 1931 session, at which the three songs mentioned were recorded and not issued; but Elsie did record a version of “Hangin’ On to That Man” that day, at least if eminent discographers Brian Rust and Richard Johnson can be trusted (I am not fortunate enough to own a copy of the unissued Decca recording with the matrix GB2920). I decided, however, that if we were to do anything with the tune, it must have a vocal refrain to it. So Elsie Carlisle learnt it–not without some difficulty in finding the right key, I think she will confess. Apparently, Elsie liked it for she adopted it as her signature tune. For our part, we produced a record with the longest introduction that has ever gone on a ten-inch disc. “Hangin’ On to That Man.” Lyrics by Frank Capano and Harry Filler, with music by Josef Myerow, alias Joe Myrow (1931). Recorded by Spike Hughes and His Dance Orchestra, with vocals by Elsie Carlisle, in London on November 18, 1931. Decca F. 2735 mx. GB3601-2. 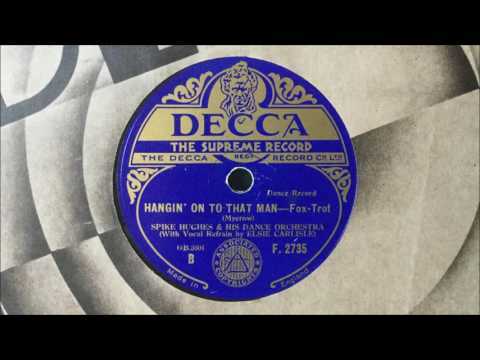 “Hangin’ On to That Man.” Recorded by Elsie Carlisle with orchestral accompaniment in London on June, 23, 1932. Decca F. 3038. In this version Elsie sings a languid introduction, and indeed the first half of the song is comparatively subdued. The contrast with the quicker and more impassioned second half gives Elsie the opportunity to engage in monodrama, which happens to be a specialty of hers. 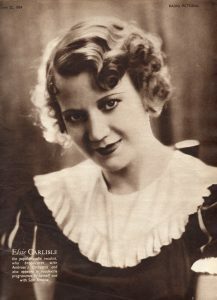 We can appreciate, with Spike Hughes, the attraction of Elsie’s pretty visage reproduced on sheet music, but we must admit that it was her ability to create a persona with nothing but her voice, in the small time allotted by the size of a shellac record, that will always define Elsie best.